Winter can seem like an everlasting season, at least it is to me. And when spring kicks in, with tulips, crocus, and all other early flowers in bloom, along with the warmer weather…I am in heaven! But when I go out to see how my plants have weathered the winter and I see some of my evergreens eaten…lets just say the critters that have eaten everything should be happy I can’t find them. I used to think Thumper and Bambi were so cute when I was younger…not so much anymore, I’m on to you woodland creatures (Snow White I think you need to get your animals on a leash). When spring reveals my damaged plants…it’s often too late. Deer have adapted quite well to the winter landscape. 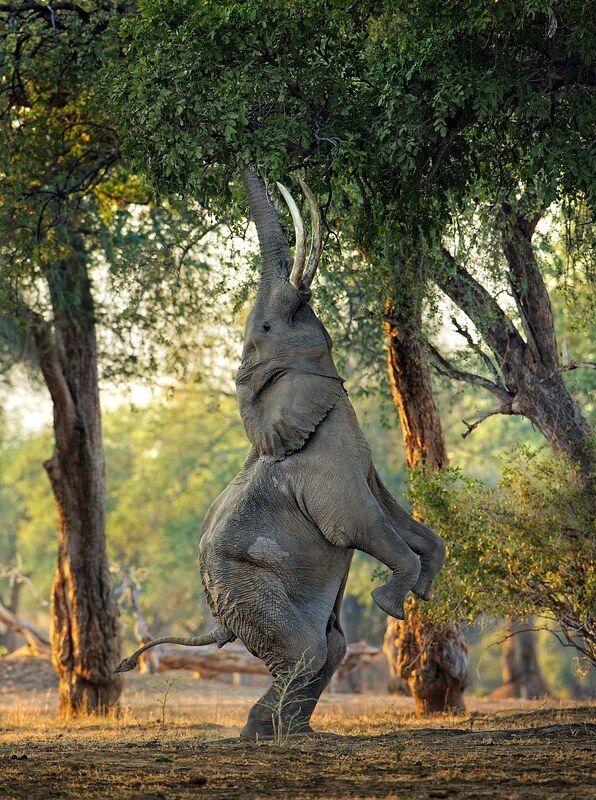 They are large in size, which gives them the ability to eat at a higher level, they can also stand on their hind legs to give them the superpower of reaching an additional 4 feet of your beautiful evergreens. 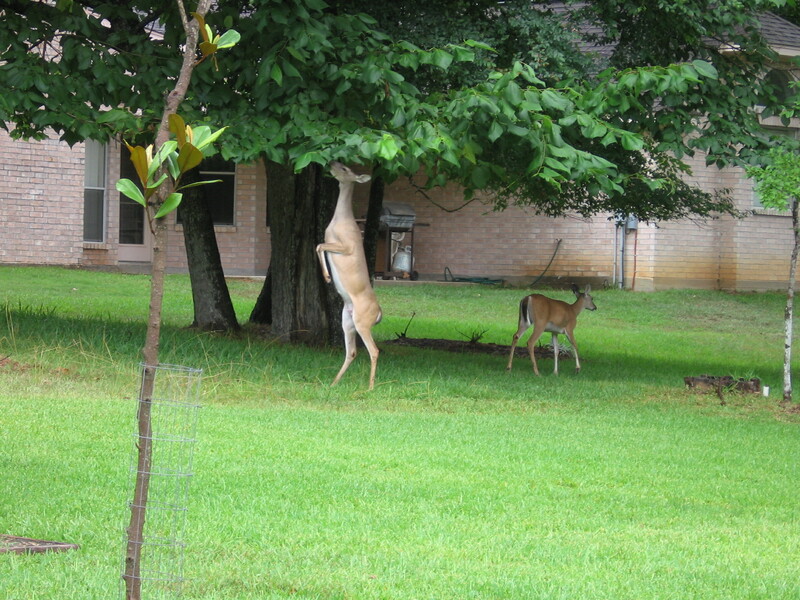 I think the deer got this idea from their friends in Africa…thankfully we don’t have either of these eating our plants! 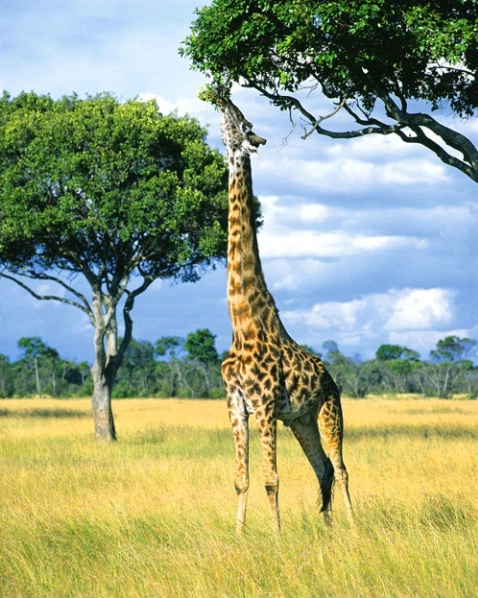 Although…it would be cool to see either roaming the backyard! Even a privacy fence won’t stop these superpowered deer…I’ve seen countless deer jump over the privacy fence in the backyard. 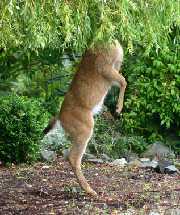 So when they jump over that privacy fence and browse (deer are browsers, not grazers!) 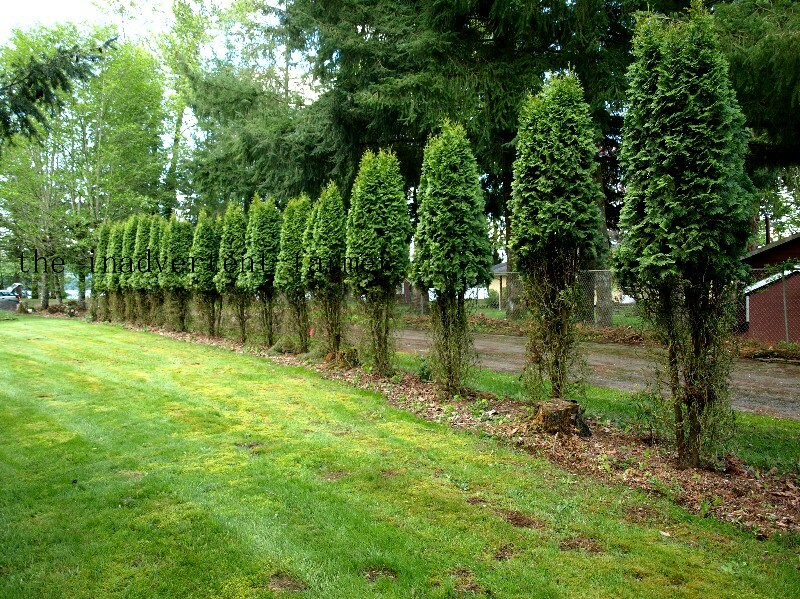 through all your prized plants, snipping and snapping off buds, branches, and bark, then paw through the snow to get at those delicious tubers and mosses, and then move on to the next yard to do the same…you’ll be cursing yourself that you didn’t think about protecting the plants in your yard beforehand. So..since we don’t want you to go through all that, we’ve included some great tips on how to ‘deer-proof’ your landscape, followed by a few myths and facts. Fencing – Yeah, I know I said privacy fencing doesn’t work, but a different type of fencing does. 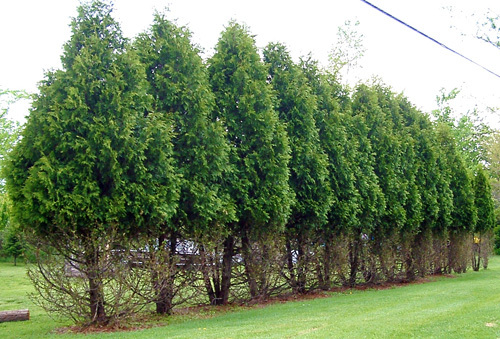 A fence put around a single plant, or a bed, can’t help fend off those super-deer. The fence should be 3-4 feet out from the plant so the deer can’t push their big heads through the fence to reach the plants. You could also add a single electric hot wire with insulatiors at the very top to jolt away the deer (they should stay clear for a while if they get jolted). Do not remove a plant fence too early, March to April, instead wait until May (around May is when deer are sticking to the high fiber diet…no roses for them yet!). Idea: Give the deer food to eat instead of your plants. Fact: Sounds like a good idea, right? Well…not really. Think about it, you are inviting the enemy over for dinner. The enemy (deer) is going to look around and see what else they can feast on, a.k.a. ‘your landscape’. The other downside to feeding deer corn is that the deer can develop a very common problem called corn toxicity. In winter, deer are on a diet of high fiber and woody plants by browsing. Corn is composted of high carbohydrates and low fiber, and is readily available to them. When the deer’s digestive system is overrun with the later, it will cause indigestion, dehydration and eventually death. The second problem with feeding corn to passing deer is that they overeat, which can cause rapid death in a healthy deer. Idea: Using a fertilizer, such as Milorganite, or other home remedies (hanging strong scented soap, human hair, blood meal, kitchen spices and herbs with a strong scent) will repel the deer. Fact: This varies. I’ve used Milorganite with no success, but that doesn’t mean it won’t work for others. I’ve never tried any of the home remedies, but with any of them you will be on full time deer repelling duty. Most of these remedies may only last up to a month, if you are very lucky (please let us know) they may last an entire season, or they may not work at all. In some cases there may be no relief and you might just have to get along with the deer and do whatever you can do to protect your plants. I have found the best luck by installing a plant fence accompanied with deer resistant plants, this continues to work for me. While it may not work for you, try some of our suggestions if you need to ‘deer-proof’ your yard and let us know what has worked for you.